TALAVERA POTTERY IS NOT FROST OR FREEZE PROOF. LIKE YOUR FAVORITE PLANT, THE POTTERY MUST BE TAKEN INDOORS BEFORE ANY DANGER OF FROST. ALSO, TALAVERA POTTERY DOES NOT LIKE TO SIT IN WATER, WET MULCH OR BE SUBJECTED TO EXTREME HUMIDITY LIKE A GROWING GREENHOUSE. 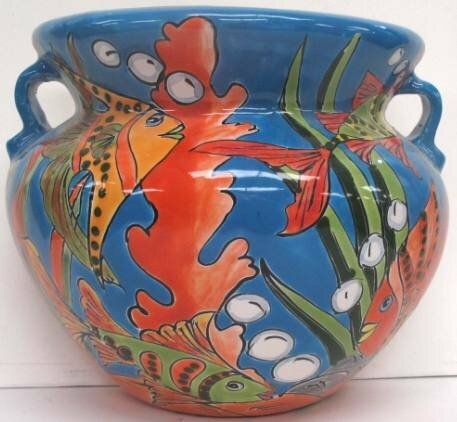 Our Talavera Pottery is handmade and hand painted in Mexico by highly skilled artisans. Each piece is unique and may vary slightly from the picture shown. No two pieces are exactly alike. Please be aware of this when placing an order. If you have any questions about this product by Talavera Pottery Store, contact us by completing and submitting the form below. If you are looking for a specif part number, please include it with your message.